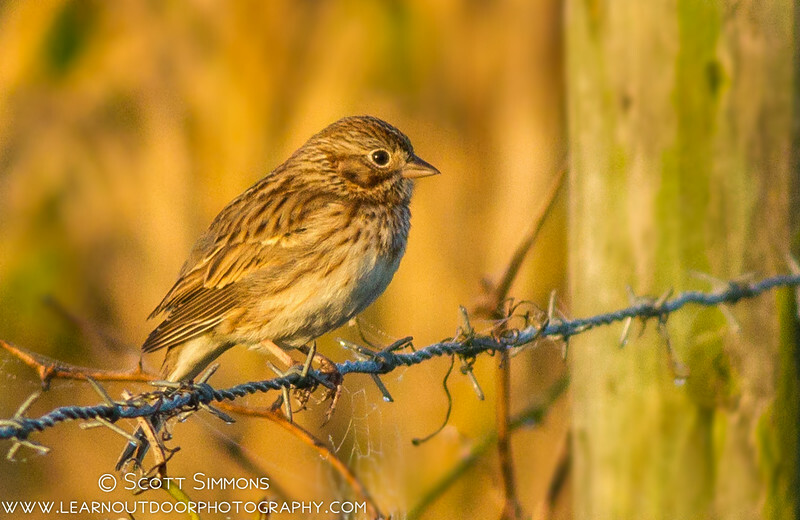 As October comes to a close I look forward to the arrival of sparrows. There's a little spot I've come to love visiting. It's just a rural road with a few areas of good sparrow habitat. On one part of the road is a little fence line with dense vegetation, and sparrows seem to be pretty active there for the 45 minutes or so after sunrise. This fence line is on the west side of the road, so in the morning, the sun casts a nice warm light onto the area, and the clearing behind the fence allows for some nice clean backgrounds. A little bit farther south on the same road there's another little spot that's pretty good for sparrows as well. 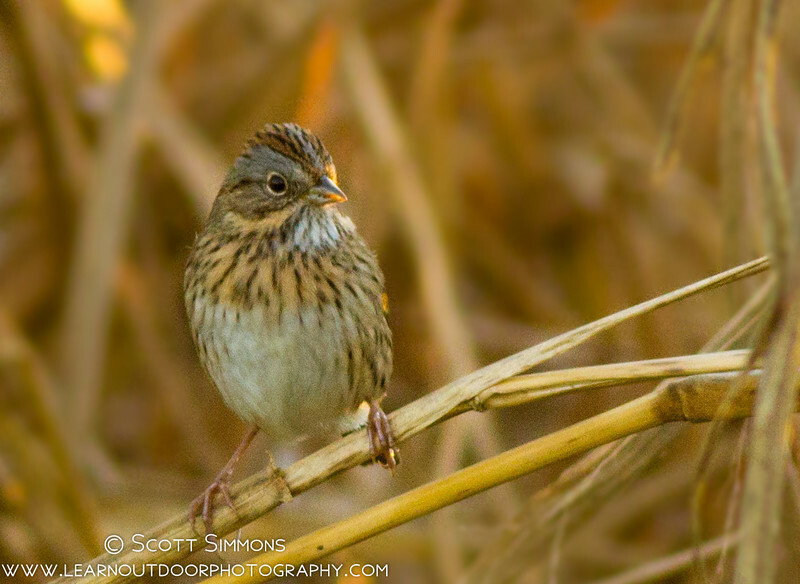 We get a lot of Swamp Sparrows here, and even a Lincoln Sparrow was seen here. Of course, other birds hang out here this time of year as well. This is one of the places I go to look for opportunities for "portrait" photos of common species. 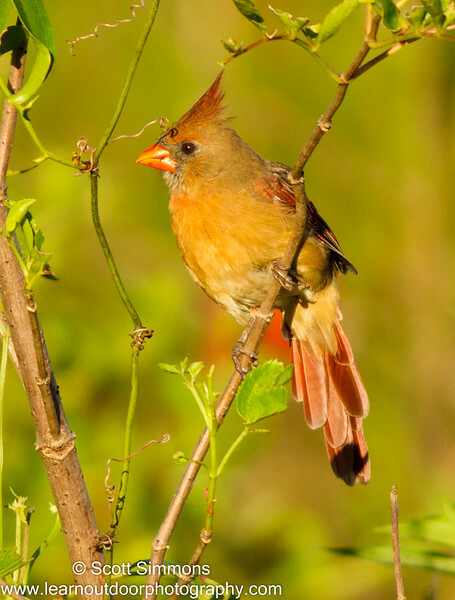 Birding is fun, especially when you do not have to leave your yard to go birding. 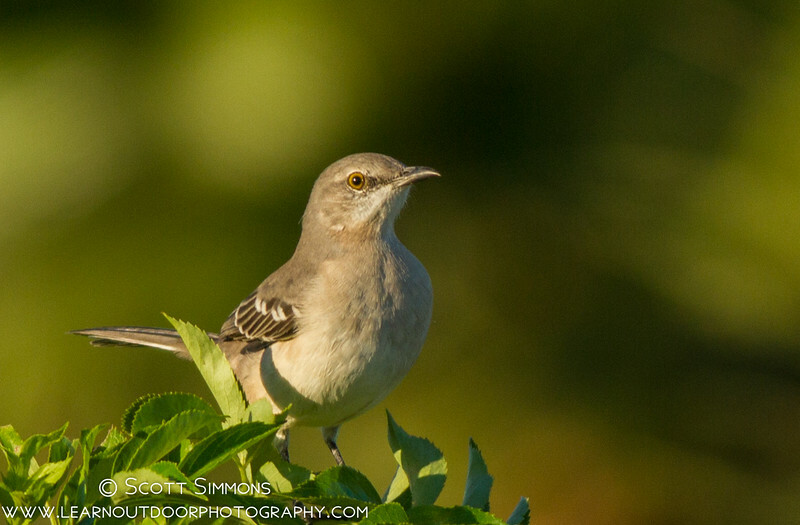 For my post I am sharing the warblers that moved thru my yard the last two weeks of September and some into October. The Chestnut-sided warbler is just one of the warblers that I am excited about. It seems the warblers are really attracted to Pokeberries. They LOVE them. 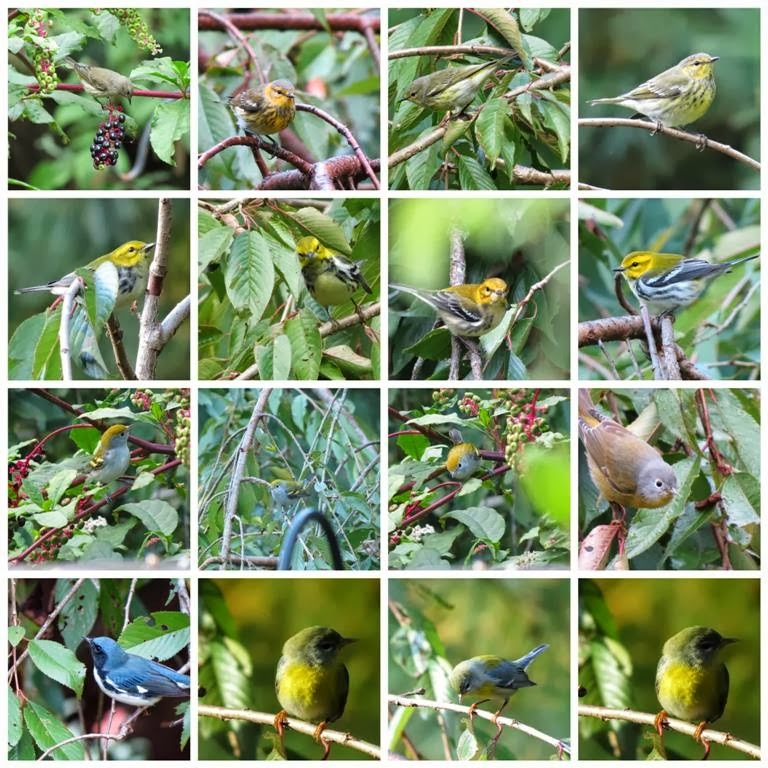 A mosaic of my fall backyard warblers. The warblers came in waves at first it was the Chestnut-sided Warbler. A fall Black-throated Green Warbler. 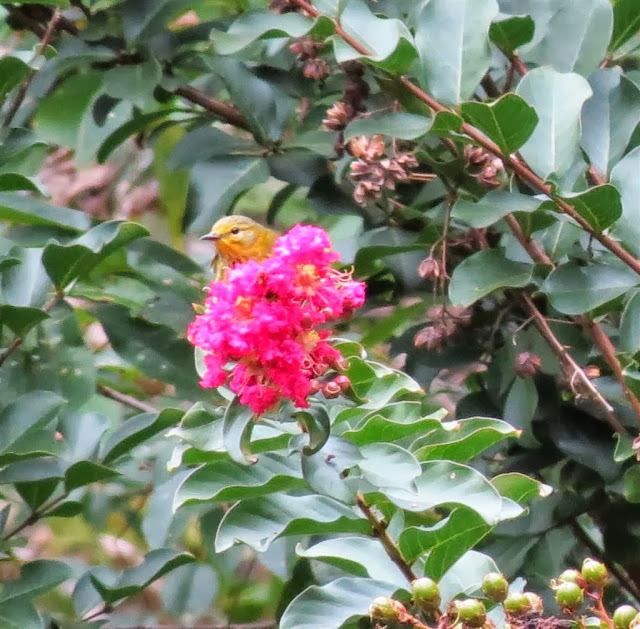 Another Cape May Warbler at the pokeberries. A fall Nashville Warbler going after some pokeberries. Another shot of the Nashville Warbler. This Goldfinch looking bird is really a Tennessee Warbler..For me the beak is one way of id-ing a warbler. Like the shot above at times I was seeing two Cape May Warblers together, but it was hard trying to focus on one bird with the pokeberries and leaves in the way. I believe I had some other warblers moving around my yard, a few times I would see a warbler disappear into our weeping cherry tree before I could id. The beautiful Black-throated Blue Warbler. 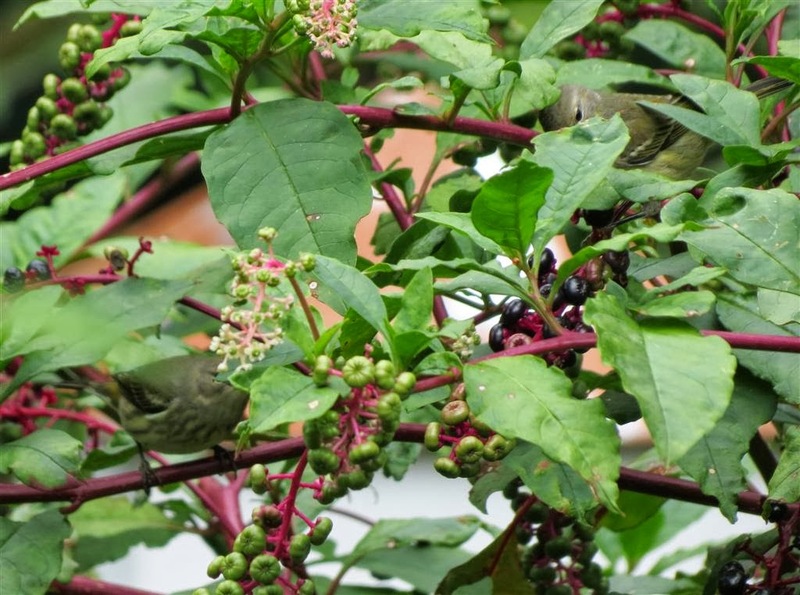 Looks like the warblers also found the crepe myrtle to be a favorite. Like the Scarlet Tanagers in my previous post about the local breeders the Scarlet Tanager. Last but not least is the pretty fall Northern Parula. The Northern Parula is a breeder in the woods next to my house. All of these photos were taken from my deck or my dining room window. It is pretty cool to be able to see all these warblers right in my yard. I am wondering what warblers I was missing during the week while I was at work. I am lucky I did not have to travel to see them, they all came to see me or more likely to eat our pokeberries. Next month is going to be quite exciting and busy for me. First, my wife and I will head to Toledo for the 7th Ohio Young Birders Conference. I have attended the conference several times over the past few years, and it is one of my favorite events. 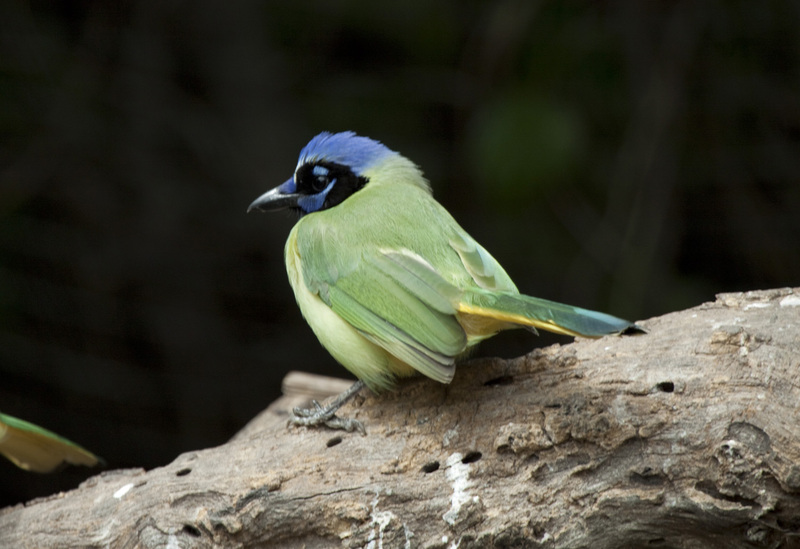 The next day, we will fly to the Rio Grande Valley in Texas and start our trip by attending the Focus on Diversity: Changing the Face of American Birding conference. I've written about this event on Birding is Fun (here) before so I won't go overboard with details, but I'll just say that you should attend if at all possible. The rest of the week will be spent birding around south Texas and checking out some of the Rio Grande Valley Birding Festival events. The birding is already starting to get interesting down there with some great rarities, and all of the usual specialty species will be new for Stephanie! 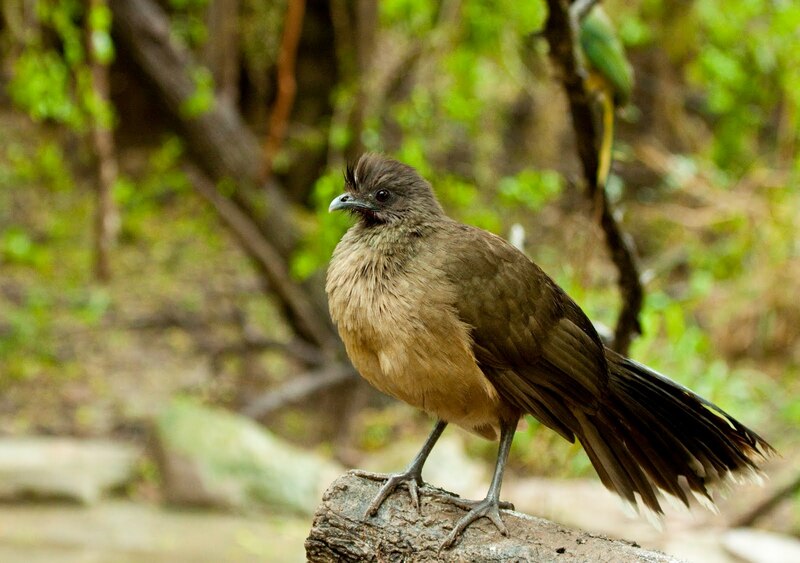 Plain Chachalaca - Not the most colorful bird in the Valley but still one of my favorites. Finally, less than a week after returning home from the Valley, I will be on my way to The Lodge at Pico Bonito in Honduras. This will be my first trip to the tropics, and I can't wait to see a ton of life birds. I look forward to sharing photos and stories of next month's adventures with you! 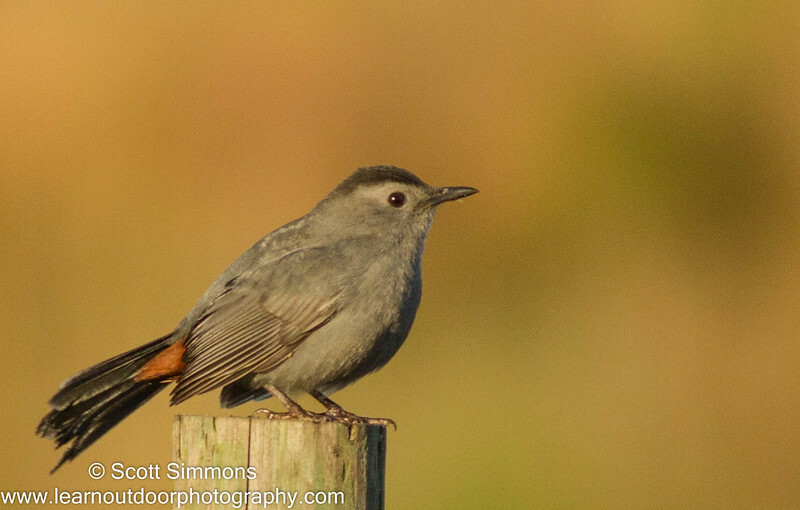 The birding had been rather slow for early October, with SW winds and warmer temps dominating. 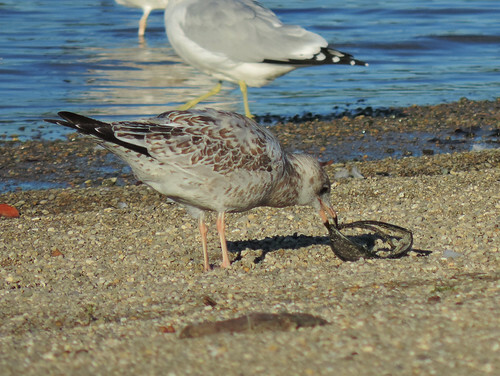 Not much change in the happenings of birds on the beach at East Fork. 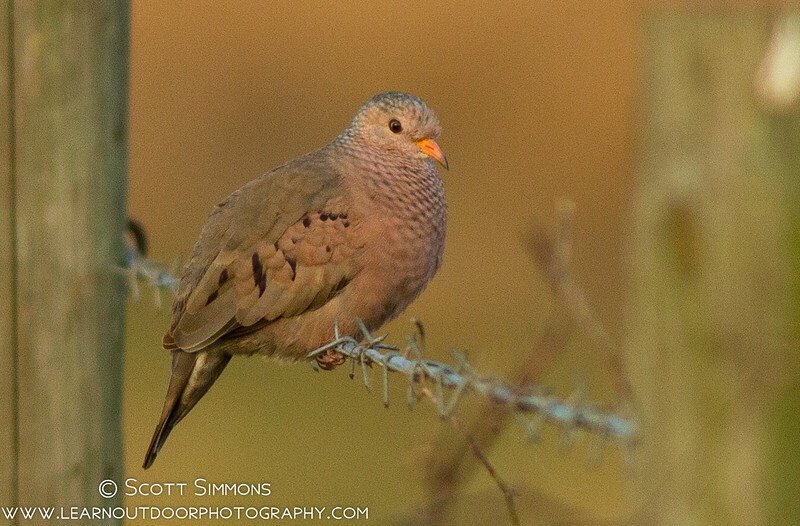 Smaller birds such as Juncos and Sparrows have arrived locally per reports, but I have yet to come across any. 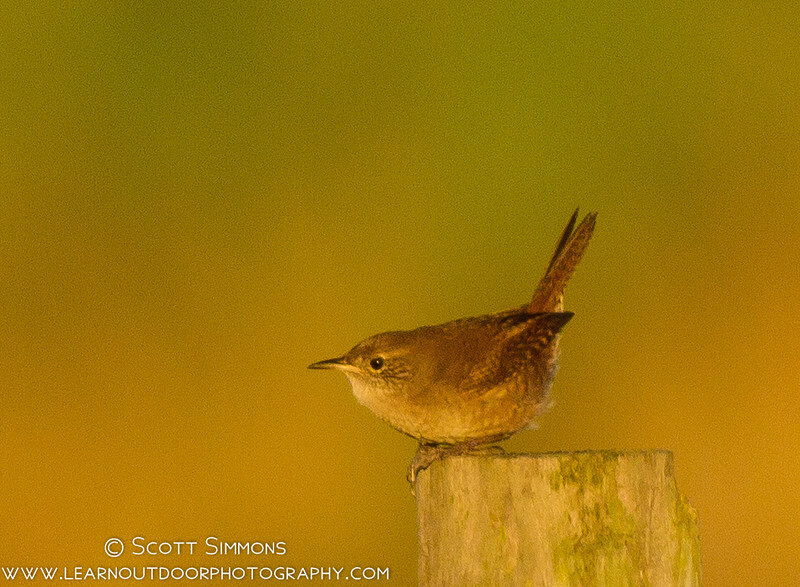 I did hear a Winter Wren a couple of weeks ago. Also, I have been working mornings and haven't been able to get out to look for passerines much. Back during the first week of October, another birder and I took a walk back to the man made wetlands/bike trail on the other side of East Fork Lake. 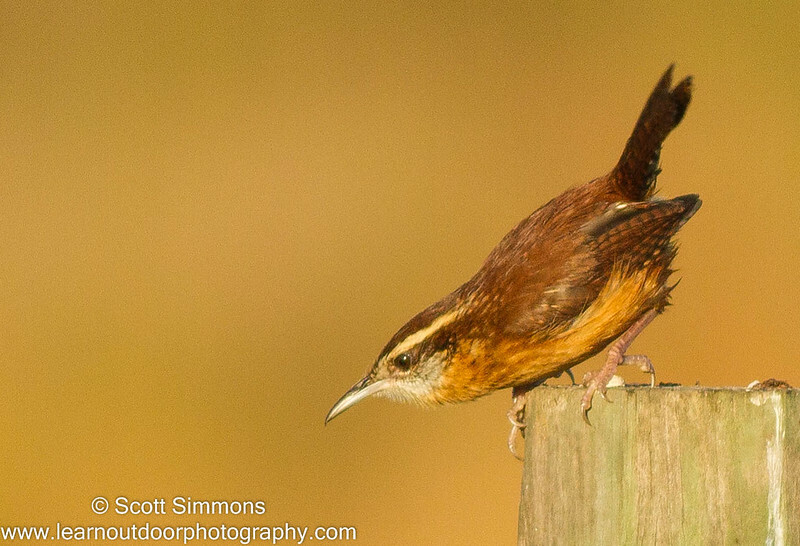 We thought we heard a Marsh Wren, but could not confirm. 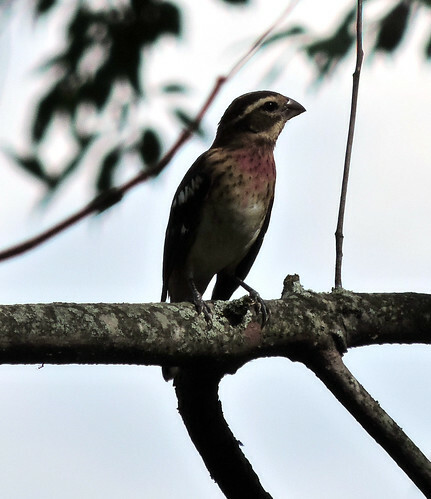 We did see this immature Rose-breasted Grosbeak migrating through. Flickers seem to be everywhere as of late, and they are always nice to see. Love their colors. Always take time to admire the common birds! 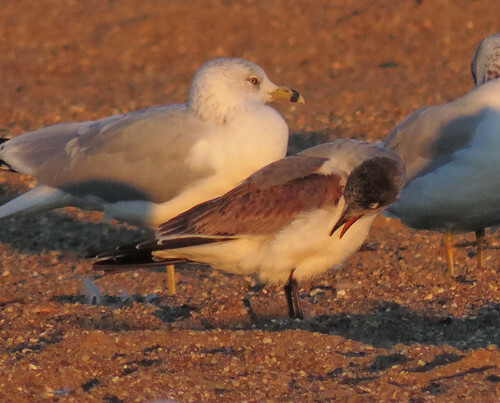 Like this immature Ring-billed Gull. As it is now mid October, the cold has finally arrived. We had our first frost this past morning here. It looks like the cold is here to stay, with reinforcing cold fronts lined up. This could only mean that the dam should break open for some good birds. This afternoon/evening, I decided to check the beach at East Fork. 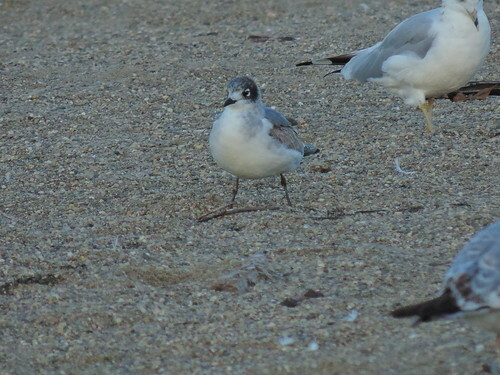 I find it as the best time to get the best idea of what is around the lake gull wise, as they all fly in to roost on the beach just before dark. When I arrived, there were people with cameras and children chasing the gull flock back and forth. I didn't expect much. I took up a position on the beach that provided the best light. After a while, the people faded away briefly and the gull flock positioned itself right in front of me. 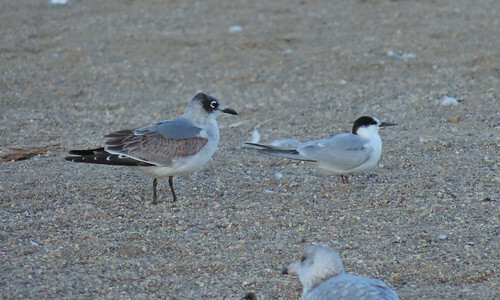 I noticed a dark winged type of hooded looking gull way out over the water, but it would not land with all the commotion on the beach. I kept watching, and finally it came in to rest. 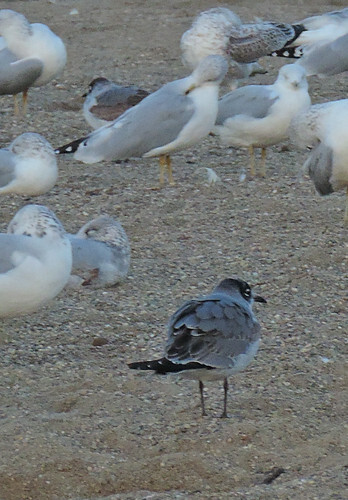 Oh, I know this gull! 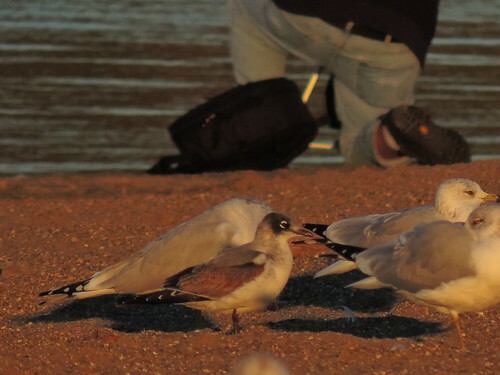 The guy in the background was chasing the gulls when I first arrived, I don't know what he was photographing. Kind of defines the birding at East Fork. As I was looking at the Franklin's in the BACKGROUND through my camera, I zoomed out to notice that there was another Franklin's right at my feet! The light was fading fast, so the quality of photos degrades. I took the camera away from my face and rescanned the flock. 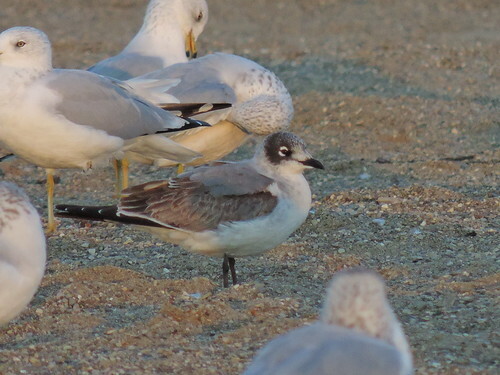 I see 1, 2, 3, 4, 5, 6 FRANKLIN'S GULLS! I couldn't get a shot of all of them, as they were scattered about the flock and people were still very close - so the birds kept shuffling. The guy in the first picture got up, scattering the gulls off the beach. 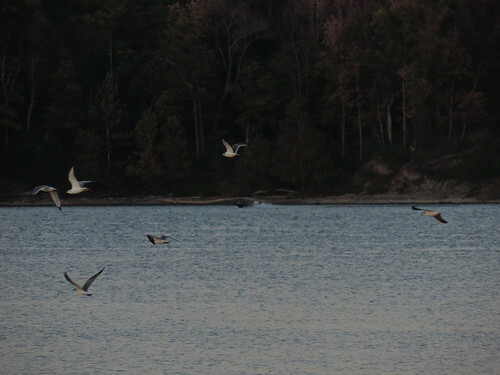 Here is a photo of the SIX Franklin's Gulls flying off into the darkness. She saw an Osprey, also known as the Fish Hawk. 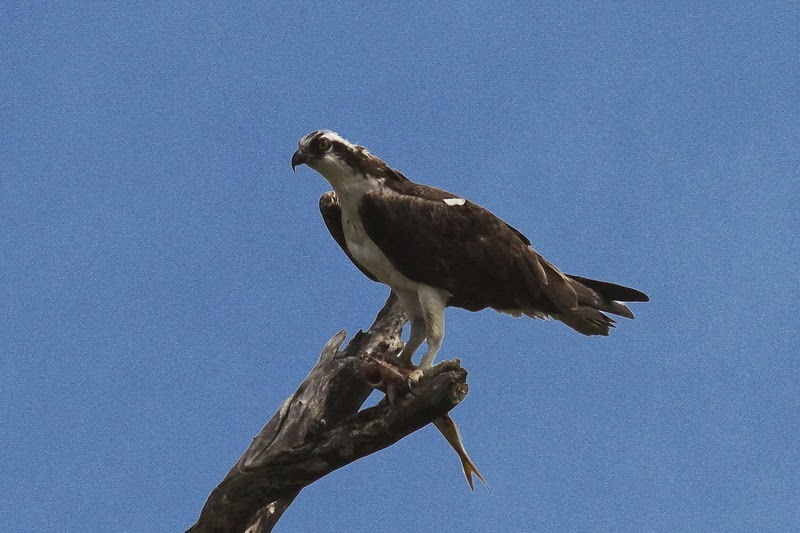 With its recovery from the devastation caused by DDT, the Osprey is again a common bird along the New England coast, and may be seen anywhere in Vermont where there is water - along our rivers, lakes, and large ponds. The Osprey’s diet is almost exclusively fish, and from what I have been able to determine, almost exclusively fresh fish. It hovers 30-100 feet above the water surface looking for fish near the surface. Finding its prey, it plunges to the water, sometimes completely submerging save for wing tips. Terres in Encyclopedia of North American Birds completes the description of the Osprey’s fishing: “Rises from water with fish gripped in both feet, pauses in midair to shake water from plumage, and to arrange fish with head pointed forward, which reduces its resistance to air, flies with it to habitual perch to eat or to nest to feed young. Reported to carry fish up to 4lbs or more.” This dull description only hints at the excitement generated when you are able to watch the real thing. The Osprey is the only bird which fishes in this manner. Gulls plop on the surface. Many aerial sea birds, like pelicans or gannets, plunge dive, capturing fish in their beaks. The Bald Eagle, also a “fish hawk,” plucks fish near the surface with its talons. The Osprey and the Bald Eagle pose interesting contrasts. The Osprey rarely eats dead fish; the Bald Eagle enjoys dead fish, and dead anything else. The Osprey is a tireless fisher. It will consume its catch, then go hunting for more. The Bald Eagle does as little work as possible. When in the mood for fresh meat, rather than carrion, it is content to let the Osprey catch a fish and then steal it. In the nineteenth and early twentieth centuries, an even greater contrast in attitude was found among coastal farmers. Where most people in those times considered hawks vermin to be exterminated (most hawks, given the opportunity, would take a barnyard chicken), coastal farmers and fishermen actively protected Osprey. They watched Ospreys aggressively protecting their nests, eggs, and young. The farmers’ young chickens ran free during the summer; it was assumed that the Osprey protected the chickens from other hawks. Coastal farmers were anxious to have Osprey nesting close to their farmyard, so they set up nesting platforms for them - a tall pole with a wheel fixed on its top. He also debunks the coastal farmers belief that the Osprey protected the barnyard chickens from other hawks. Rather than staying away from the Ospreys, the other hawks simply went away; they went inland “for the purpose of rearing their young in security.” When the shorebirds and waterfowl returned to the coastal marshes, the other hawks returned as well. By then, the Osprey had completed its nesting and had begun moving south. The Osprey is one of the most widely distributed birds in the world, found on every continent in the world except Antarctica and even on some remote Pacific Islands. 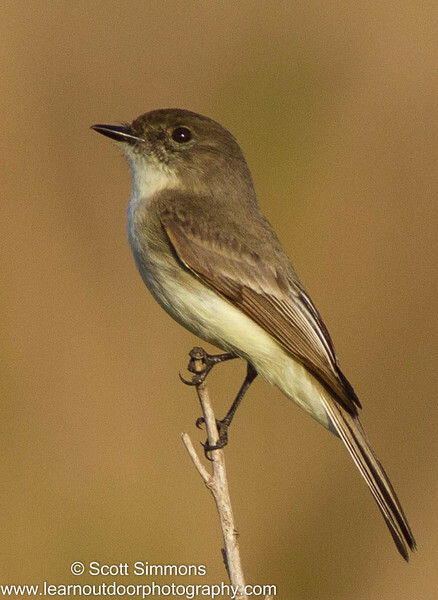 In the western hemisphere it nests in North America; northern populations migrate to warmer climates for the winter. The Osprey is a unique bird of prey. It belongs to the Order: Falconiformes - the diurnal birds of prey. But the Osprey has been on its own evolutionary path for a long time. Taxonomic classification constantly changes. At one time the Osprey was in a Family by itself; the other Families being Hawk Family and Falcon Family. 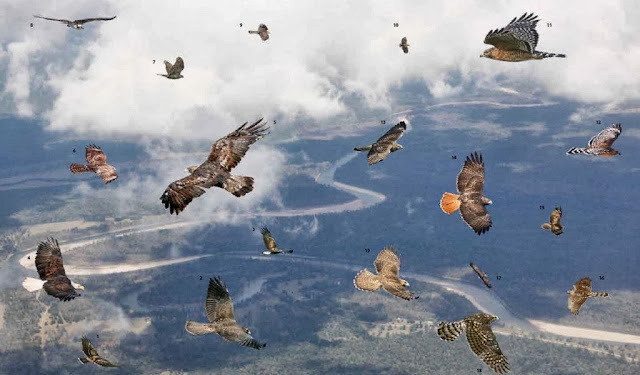 Current classification puts it in a sub-Family of the Hawk Family, making it a little more closely related to the hawks and eagles than to the falcons, but not by much. It is the only member of its sub-Family. The point is, there are things about the Osprey that are unique among the diurnal birds of prey. For example, the Osprey has long, strong claws, curved about one-third of a circle. The claws are round. The toes are equal length. The lower surface of the toes are covered with spicules (small, bony spines) which help hold slippery fish. The outer toe is reversible (like an owls’) so that it can hold prey with two toes in front and two in back. Its plumage is compact which reduces wetting when it plunges into the water. 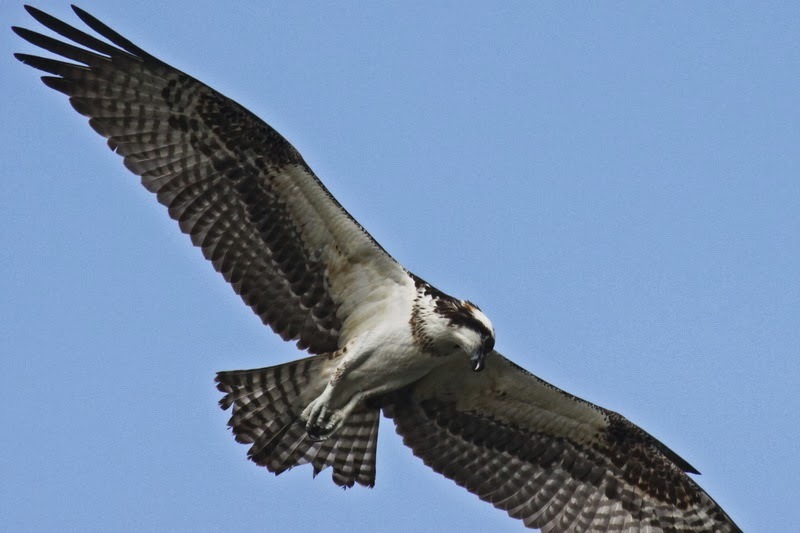 These are only some features of the Osprey which make it unique among the hawks. The scientific name for the Osprey is Pandion haliaetus. The genus name refers to the complicated Greek legend of Pandion, king of Athens, and his two daughters. The rules of taxonomic nomenclature require that once a name has been applied, we are stuck with it, even if it is wrong. This is one of those cases; there is no reasonable, or even unreasonable, reason for applying the name “Pandion” to the Osprey. The best that can be said, is that this was a flight of mythological exuberance. The species name, haliaetus, does a little better; it means “sea eagle” from the Greek. How the name “Osprey” came to be applied to this “Fish Hawk” is a mystery. “Osprey” probably derives from the Latin, meaning something like “bone breaker.” The original “bone-breaker” known to the Romans was the Lammergeier, or “lamb vulture,” which dropped bones from a height in order to break them. No one seems to know how “osprey” came to be applied to the bird we know. However, translators of the King James Version (1611) do refer to “the eagle, the ossifrage, and the ospray.” An early commentator on this translation explains that the ossifrage is a “species of eagle” and the osprey is “the black eagle.” Clearly these theologians were a bit confused, especially since Shakespeare a few years earlier had written (correctly) in Coriolanus: “As is the osprey to the fish, who takes it by sovereignty of nature.” This suggests that for reliable observations of the natural world, you may be better served by a poet than by a theologian. Well, I'm pooped. Yesterday morning I woke up in Pittsburgh, Pennsylvania. This wasn't a surprise; I was staying with friends and visiting family where I grew up. There had been a report of a Connecticut Warbler at the Beechwood Farms Nature Reserve the day before, so Sarah and I tried to squeeze in a visit there on our getaway day from our brief vacation in the Keystone State. Beechwood is the headquarters of the Audubon Society of Western Pennsylvania, and it turns out it's a pretty awesome place. The Connecticut didn't make an encore appearance while we were there, but we got plenty of other nice migrants on the short trails that cross a nifty variety of habitats. I highly recommend this as a birding stop for your next trip to Pittsburgh. For that matter, I highly recommend it for MY next trip there, since we could spend only an hour there (we pushed it to 80 minutes) and still have time to get home for Cranefest. Cranefest is an annual festival for my home Michigan Audubon Society. As you may have gathered, it has to do with cranes - lots of 'em. This is the time of year that thousands of Sandhill Cranes gather to discuss and consider their imminent migration to warmer pastures. It may not exactly be Grand Island, Nebraska, but it's a great spectacle nonetheless. The sounds where a thousand or more cranes have gathered is the sweetest ear candy to me. This year our guest speaker was none other than Richard Crossley, master of producing books that make people go, "What the......?" The Shorebird Guide was revolutionary. The Crossley ID Guide: Eastern Birds made us wonder what this British character was thinking and how far he was going to take this crazy idea. The Crossley ID Guide: Raptors made us realize he was serious and wasn't going away. Richard Crossley and Sarah at the Bernard W. Baker Preserve in Michigan. Two awesome people with whom you should bird if ever given the chance. You all know about these books by now. Let me just say that after hearing Richard passionately relate the story of his life (with liberal attention to the genesis of the idea for the ID Guides), I'm glad he and his books are here to stay. The guy has some points, and the more I use those books, the more they grow on me. I have to admit when I first purchased the Eastern Birds guide, I put it on the shelf like a souvenir baseball. A nice novelty to have, but not something you'd ever actually play with. By the time I was writing reviews for the Raptors guide, I was convinced Richard was onto something. But I'm not here to sell books. There were cranes at Cranefest. And eagles. And lots of non-birders. That was the coolest thing about the festival: it was packed with potential converts! Sarah and I had a ball getting the scope on a nice Belted Kingfisher, a showy drake Wood Duck fresh into breeding plumage, and a pair(?) of male Eastern Bluebirds that were flycatching from some dead snags. Sandhill Cranes on a sunny, warm, October day in Michigan. Life is good. The highlight for our outreach work toward to the non-birders were the pair of Bald Eagles. Scope views of eagles on a sunny fall day may be old hat to birders, but is there a better advertisement for birding as a hobby? 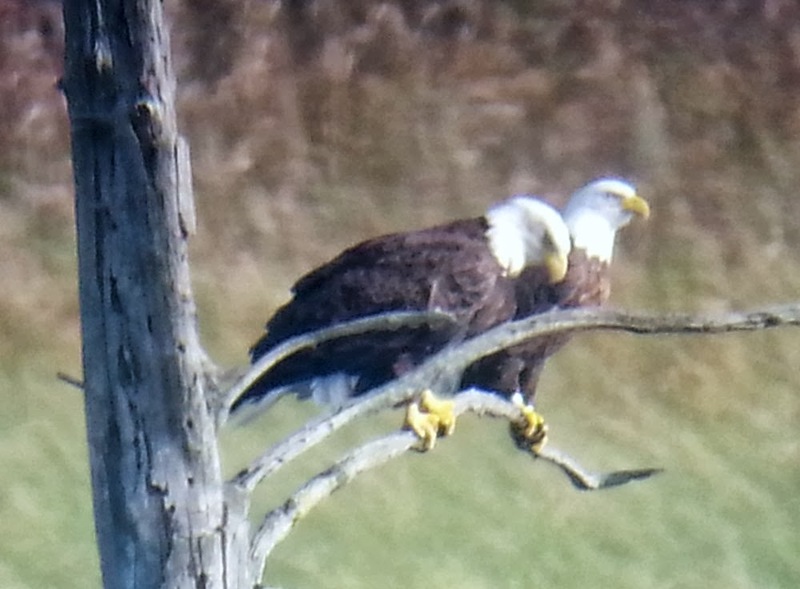 Phone-scoped Bald Eagles. 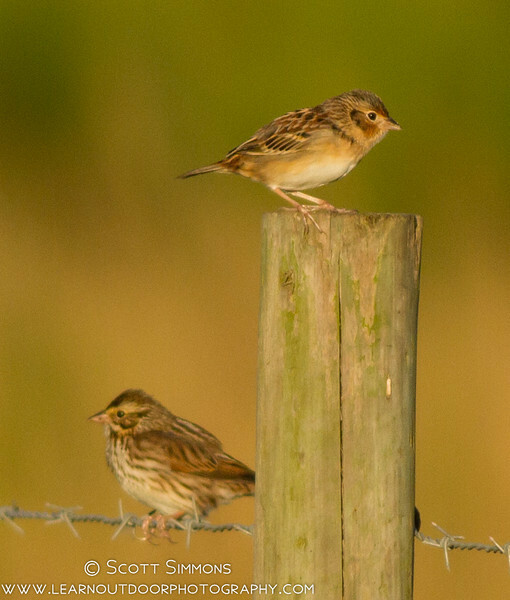 Not much of a photo, but great ambassadors for birding! I tell you all of this to explain why I don't have much of a submission for Birding is Fun this month. I woke up in Pittsburgh, looked for a non-existant Connecticut Warbler, high-tailed it back to Michigan through Friday traffic, got inspired by Richard Crossley, then spent the whole day today watching cranes and things at the Bernard W. Baker Sanctuary. Yes, I suppose I could have gotten this done last week, but there was birding to be done if I recall correctly. 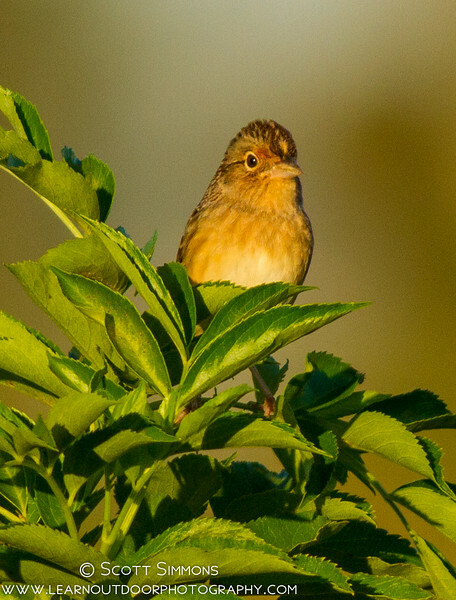 1) Bird you local Audubon preserves. There are some hidden gems there! 2) Buy and study Crossley's books. There are hidden gems there, too! 3) Don't procrastinate, especially when your Birding is Fun fans are waiting for something good. If you are ever in Colchester, CT, I can recommend a good place to bird. It is just a short drive 2.3 miles from the center of town. Drive south on Route 85 and take the left-hand fork onto Route 354, also known as Parum Road. After crossing Route 2 look for McDonald Road on the right. A short drive through a neighborhood will open up to a country road. As you come around the bend, you will see the parking lot on the right. At the edge of the parking lot is a lovely wooden gazebo. You might even find a Barn Swallow perched on the roof! The main pond is just beyond the gazebo. I have found geese, herons, ducks, cormorants and flycatchers in and around this pond. 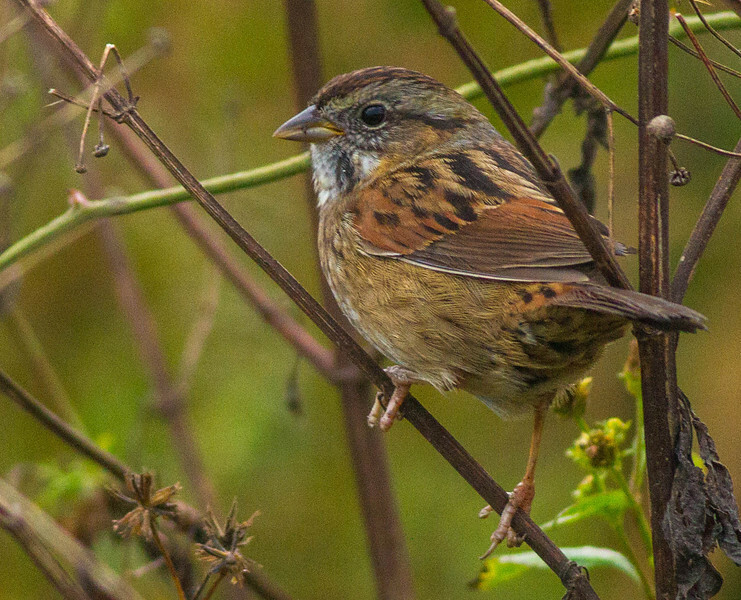 Sparrows and juncos will hop about on the grass or work their way through the bushes. In the summer swallows gather on the overhead wires. It's a great place to bring your coffee, or tea and breakfast or lunch and just sit and watch birds. or find a family of Canada Geese paddling about in the water! Of course, it is a great place to bring a birding buddy! My friend, Dawn, loved this woodland path. Just make sure to bring bug spray in the summer. However, we did find a few warblers and vireos in here as well as a family of Wild Turkeys near the forest edge! Above the forest I have often seen and heard Red-shouldered hawks soaring and screaming. In the forest I have heard Veeries and wood thrushes. 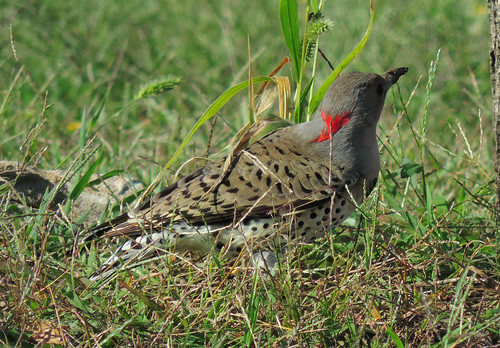 It is also possible to see Northern Flickers, Red-bellied, and Downy or Hairy Woodpeckers. White-breasted nuthatches have also been seen climbing the tall pine tree trunks! After you have explored the large pond and surrounding meadows and forest, there is always the smaller fishing pond across the road. In the summer is it dotted with colorful lilypads. Many birds like to drink and forage along the stream that tumbles through these culverts. Cedar Waxwings can be found on both sides of the road. as well as Eastern Bluebirds! There use to be Bluebird boxes in a small meadow by the fishing pond, but when I was here last summer they had all been taken down. Perhaps it was because too many bees moved in! 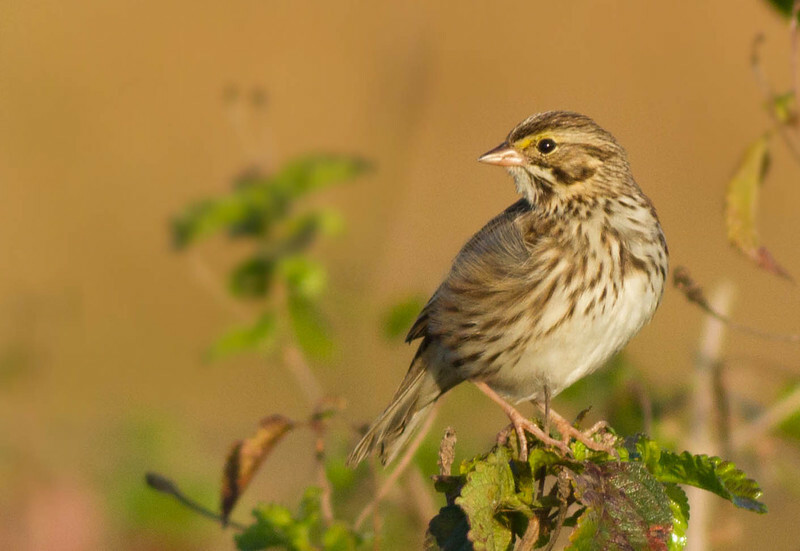 There are open meadows on both sides of the road with several kinds of sparrows along with Common Yellowthroats and possibly bobolinks hiding in the grasses and wildflowers. If you love butterflies and/or dragonflies, this is also the place for you! And if you arrive early enough, you might just catch a glimpse of a White-tailed deer slipping into the woods. As of this writing 49 species have been recorded in eBird at Cohen Meadows Nature Park, but it is an under-birded location. I would love to see more eBirders visit Cohen Meadows Nature Park and submit more data from this peaceful and outstanding birding location. Just a note: This location is called Cohen Meadows Nature Park in eBird but is called the Ruby and Elizabeth Cohen Woodlands on the Colchester Town webpage. For more information or to visit my blogs, just click on one of the links below. eBird Hotspot Explorer-view eBird Hotspots all across the world!